Disclosure: When this was published, I did currently own Heliospectra shares. I wrote this article myself, and it expresses my own opinions. I am not receiving compensation for it. I have no business relationship with any horticulture-related companies that are mentioned in this article. This article should not be regarded as a buy or sell recommendation or investment advice in any way. Remember to always diversify your investments. 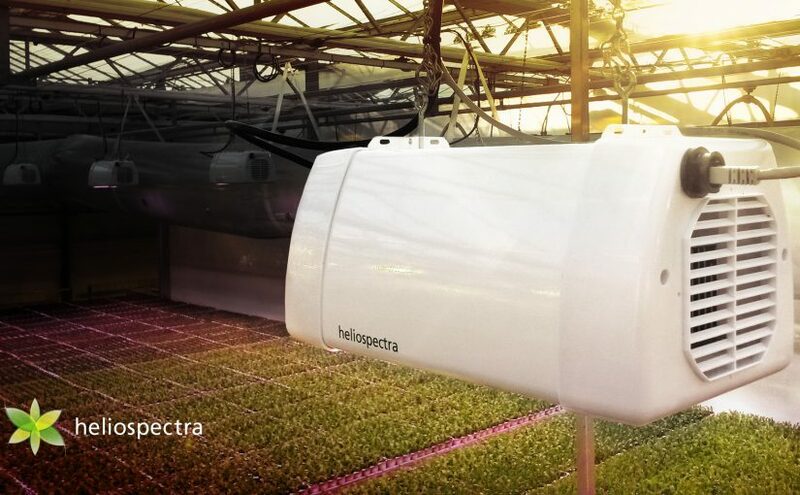 Heliospectra was founded in 2006 and they develop and sell intelligent greenhouse lighting. Intelligent in terms of remotely adjustable light spectrum via computers and mobile devices. The were listed in June 2014 on First North in Sweden with the ticker HELIO and in October 2014 on the American OTCQB with the ticker HLSPY. There are plenty with competitors worldwide who make greenhouse lighting. What makes Heliospectra stand out from the crowd is their lights’ adjustable spectrum. And what makes them stand out even more, is that you can change the lights’ colors to mimic different sun lights of particular seasons or from different parts of the world, not manually by pushing buttons or with a physical remote, but via software on your desktop computer or mobile device. Below you can see what their product looks like. 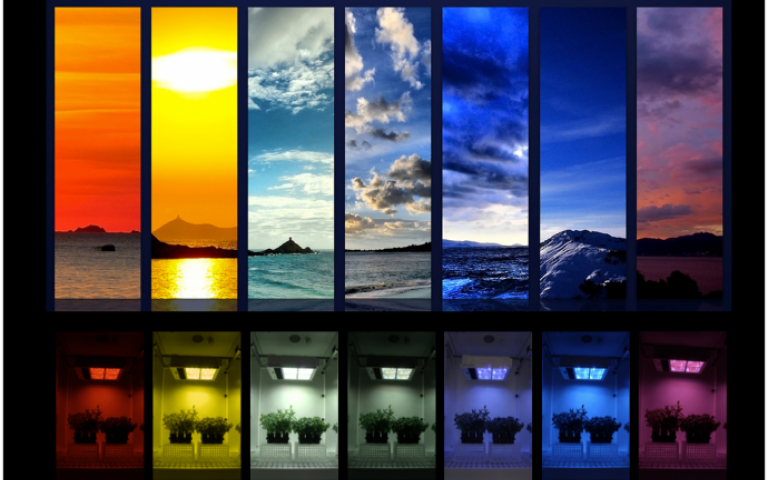 According to their own and others research, different light colors has significant effects on the plants. By finding and using the best mix of colors during a plant’s growth, you can achieve; Shorter cultivation time, better taste, and better looking plants, compared to fixed spectrum lights. The user does not necessarily have to experiment themselves in order to find the best lighting as Heliospectra provides the users with numerous light recipes for them to download from Heliospectra’s website. Below you find a table with Heliospectra’s current product offering. Next great advantage is their lights’ low power consumption compared to its competitors who uses the more seasoned technologies such as High Intensity Discharge lamps (HID). At www.growershouse.com you can find several instances of commercial fixtures with 1000W lights. Let’s take a look at possible savings. 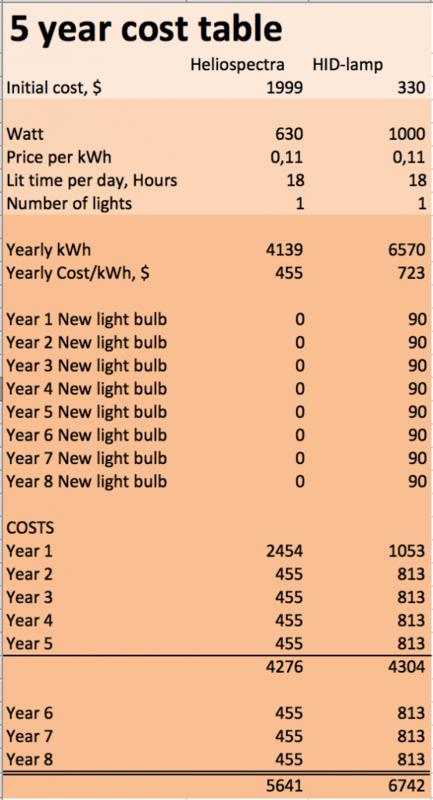 This calculation shows us how LED has a higher initial cost but then lower operating costs due to lower power consumption, and they break even compared to each after about 5 years. This comparison is made in its simplest form. To reach the next level you would also account for; Electricity costs for ventilation for HID-lamps which is not necessary for LED or turning up the heat as LED does not generate as much heat, shorter cultivation times with LED, i.e. plants grow faster and you can grow and sell more over time compared with HID, and lower water usage as HID-lamps dry out the plants and soil more than LED does. Heliospectra has one ace up their sleeve against their competitors – bio feedback. They have patented that technique on several markets during the last years and their patent currently covers; Europe, USA, Russia, China, Canada, Japan, and Hong Kong. They have not disclosed too many details about their biofeedback technique yet, but it involves sensors that detects how the plants are performing, and depending on the results, the technique can adjust the light to maximize the yield. According to the same press release, it seems it will be possible to connect these sensor to existing products, such as the LX60-series. And right before this analysis was published, Heliospectra announced an improved version of the LX60-series light with water-cooling, which will be used on the International Space Station, in space, and their first deliveries for this project are scheduled to August-September 2016. The website www.ledgrowlightguide.com contains reviews across several brands and their models. Their Heliospectra reviews sound very positive, as they also do for many other LED brands. In a broad sense, many LED lights seem to perform very equal, at least in terms of electricity consumption. If the user only needs a few lamps with variable spectrums, they may choose Heliospectra or some other brand. But, when it comes to large scale grow houses, a few percentages better electricity consumption, better yield (up to 16%), faster handling, i.e. requires less hands-on, quickly escalates to thousands and tens of thousands of dollars in differences when choosing between Heliospectra and something else. Imagine you have 200 grow lights and when you want to adjust the spectrum as the plant enters the next phase. You can use a remote to walk around with, or, you can sit by a laptop and adjust them all with a few mouse clicks. This picture illustrates that pretty well. 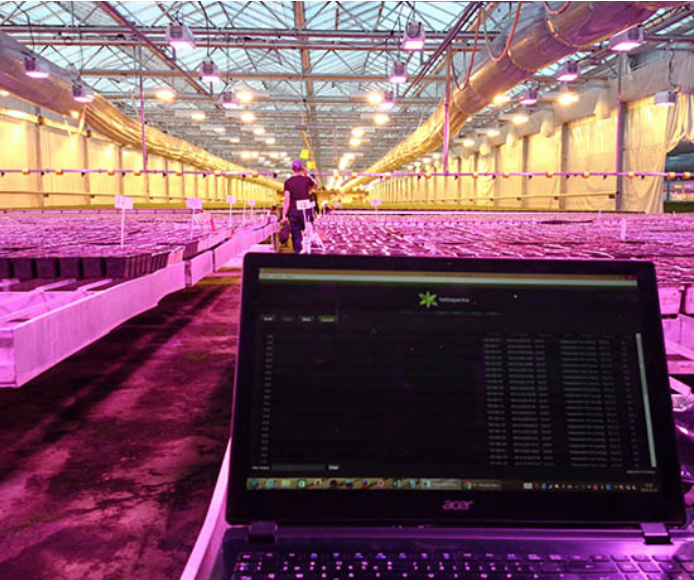 Markets and Markets, a global analysis house, has published a report about the grow light industry where their report costs $4650 . In their summary, they mention these nine competitors together with Heliospectra, among the companies that are expected to be among the key players in the future. Among these competitors, Lumigrow is currently the only one who will be competing for the same clientele as Heliospectra. 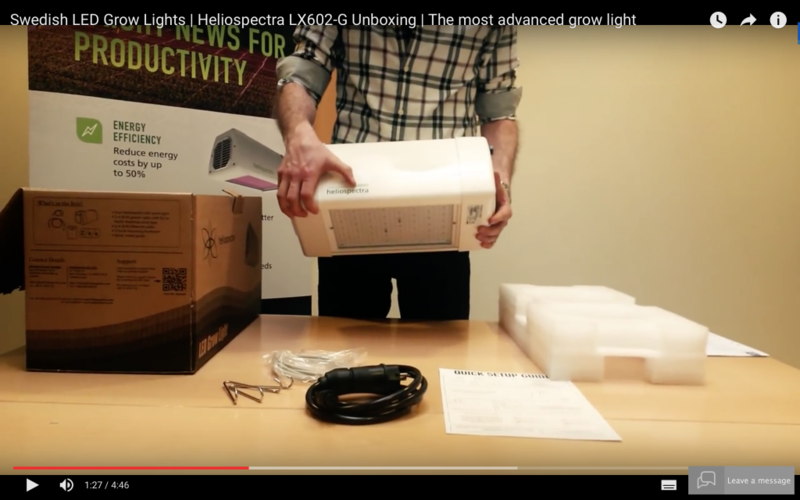 Lumigrow offers, just like Heliospectra, fixed and variable spectrum lights, together with control software! Lumigrow is not listed on any market so you cannot, unfortunately, diversify your horticulture investments by taking in Lumigrow into your portfolio. Lumigrow states in their most recent press releases’ that they have ”over 3 000 installations in 30 countries…more than 200 universities”. Installations as in customers. They have several reseller partnerships. If each customer has 15 lights, that would equal to 45 000 sold lamps, which we believe is a conservative guesstimate. If each is sold for $1500 it would mean revenues of at least 67 500 000 MUSD. A just as rough estimate for Heliospectra would be: Revenue between 2012-2015 was roughly 2,4 MUSD. Divide that by an average of $1600 per light. That would give us a guesstimate of 1 500 lights. Whereas Lumigrow has total sales around 67 MUSD, Heliospectra’s total sales have reached 2,4 MUSD. Just to give you a sense of the difference in size between them. 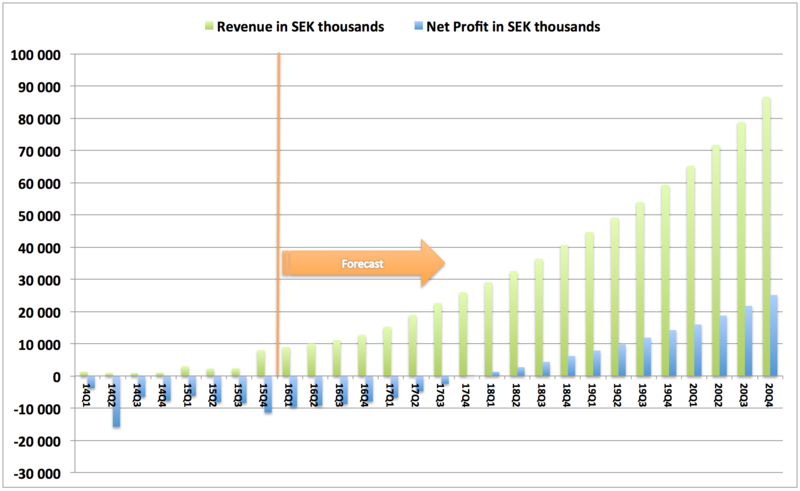 Above you see Heliospectra’s historical sales figures together with our forecast. The forecast is based on influences from Market and Market’s forecast of an annual growth rate of 27% between 2015 and 2020 and our interpretation of Heliospectra’s own forecasts. In their year-end report for 2015 they say ”The board does not present a qualified forecast for 2016 but overall, the company is well positioned for an acceleration of sales and deliveries.”, which leaves us pretty much with our own view of the market. Heliospectra has their own web-store on their website. This is probably good for their small quantity sales to small growers such as restaurants, universities and smaller growing houses, to keep the buzz alive out there. But that is peanuts and it takes more than that to earn the million dollar deals from the big players. Their single largest order thus far is from September, 2015, an order worth 5,7 million SEK (672 000 USD), to Las Vegas. That press release highlights two important points here; (a) The current market is still stuck in their old tracks and they need cradling and guidance before they become ready to leave the old and trusted technique for the future, and (b) the customers need to do their own due diligence, as in understand the technique and make the calculations themselves, about in what ways they will gain and how much. This client did that and also travelled from Las Vegas to Sweden in order to inspect Heliospectra’s products thoroughly and on-site. Another customer ordered Heliospectra’s new vertical light for a value of 1,8 MSEK (229 000 USD), and this is among the first vertical lights on the market. The fact that this customer has ordered from Heliospectra earlier and now ordered again, and a recently introduced new product, proves they trust in Heliospectra, and this is a good sign for the future. Heliospectra’s products seem to deliver on their promises. But is that enough in order to succeed and to maintain double digit yearly growth ? No. Here are two challenges Heliospectra will have to address. First, Heliospectra must broaden their sales force and channels. They need to partner up with important resellers in the same way Lumigrow has done. This would increase Heliospectra’s indirect workforce dramatically. Fortunately, Heliospectra has initiated their quest down this path already. In February, 2016, they announced their latest recruit, Caroline Nordahl Wells, as their Vice President of Sales and Marketing, and her background is interesting. She has a broad sales background, as can be seen on her LinkedIn-profile. But there is one thing that is the cherry on top. Do you remember our comparison with LumiGrow? Caroline is a co-founder of LumiGrow and she was their Chief Operating Officer. She has already done what she will be doing at Heliospectra, for four years at LumiGrow. This means she knows what needs to be done, how it is done, and she has all the connections already. In that same press release they state, ”Heliospectra doubled its US sales headcount in 2015 and will add more sales professionals in 2016 to fuel this growth with Caroline’s proven strong leadership.”, which is by the book right now. This one sentence also caught our attention from her LinkedIn-page, ”Prior to joining Heliospectra, Caroline served as an executive at LumiGrow, a company she co-founded, where she led the organization in achieving profitability six quarters after series A funding.” That’s an impressive achievement. Second, in order to grow as rapidly as we project, they need to have more working capital in order to be able to earn these million dollar deals. That is because large customers generally want large quantities, fast. If Heliospectra can deliver with a few months delay whereas LumiGrow can deliver the same week, they might just as well choose LumiGrow. They cannot wait for several smaller orders to arrive with months apart. Thus, Heliospectra must build up some stock. With their current cash situation, that will not be possible. That is why we believe they will have to do another round of fund raising, e.g. loan, share issue or private placement. It will still take a while before they reach break even and together with current quarterly results they will drain their cash and need more funding, maybe already by this summer. In this DCF analysis we have historical numbers and our own forecast. Let’s mention a few key factors which play a big roll in this machine; We are counting on a quarterly revenue growth of 10-25% and after 2020Q4 with 4% eternal growth because of Heliospectra’s small size today versus the total market size, we expect their gross margin to increase the upcoming two years. The beta of 0,5 is our own, calculated separately against First North Sweden SEK PI and OMXS30 indices, and the results were almost identical. 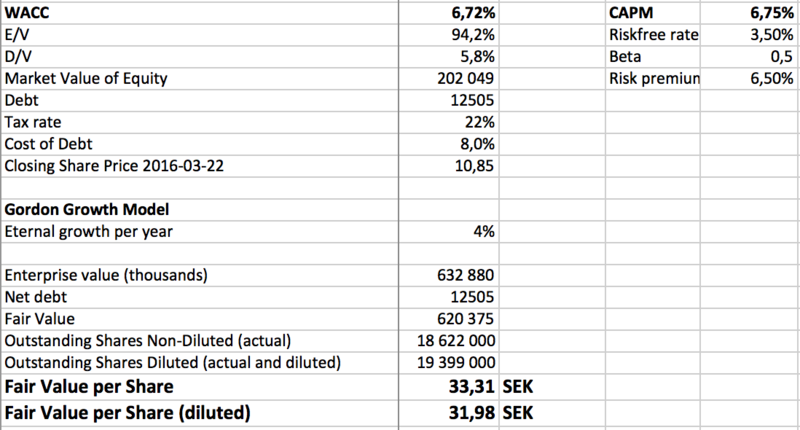 With all this laid out, we have arrived at a target price for the share of 32 SEK. A share price of 10,85 SEK gives a market capitalization of 210 MSEK (25 MUSD) and share price 32 SEK gives a market cap of 620 MSEK (75 MUSD). We believe it will reach the target within 24 months and there are a couple of reasons for this. First, Heliospectra’s products haven’t had their true break-through on the wider market yet, in terms of several very large orders, but, they are moving in the right direction. Second, the risk of running out of cash, requiring a new fundraiser, is very real. When the wider market is starting to internalize Heliospectra’s products and when break-even levels are visible by the horizon, that’s when we will start to see the share price start climbing. There are 777 000 outstanding options that were issued i April, 2014, for the management team. Each option entitles its holder to subscribe for one new share at a subscription price of 12 SEK, between March 7th to May 7th 2016. In other words, these ”incentives” for the management are currently out-of-the-money and soon worth zero for its holders. Although, if the share manages to rise 10-20% before they expire, they might exercise them. That would give Heliospectra up to 9,3 MSEK, which would carry the company forward another quarter before they run out of cash. If all are exercised, it would dilute its current shareholders with roughly 4%. Welandson family, who is behind Weland Värdepapper AB and Weland Stål AB, owns a third of the company. 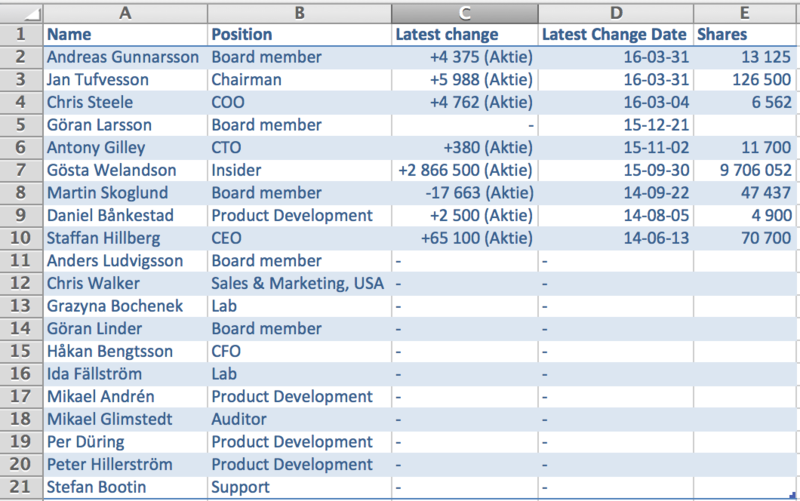 Industrifonden, an incubator fund founded by the Swedish state in 1979, owns a tenth. Avanza’s clients, a Swedish retail internet stock-brokerage, has increased their holdings as well as Nordnet’s clients, also a Swedish retail internet stock brokerage. Gösta Welandson, part of Weland family, has significantly increased their holdings during the last twelve months. The two most recent insider buys are ”corrections” according to Heliospectra’s website, so we cannot put too much weight on those. If we see more insiders ”scale in” during the next year, we will interpret that as a positive sign. In this comparison we really don’t have any good equals to Heliospectra. Either, the above peers are in several other types of markets or they are in the same market but they are much older than Heliospectra, and thus in a different phase, which means you should not put too much weight on this segment. 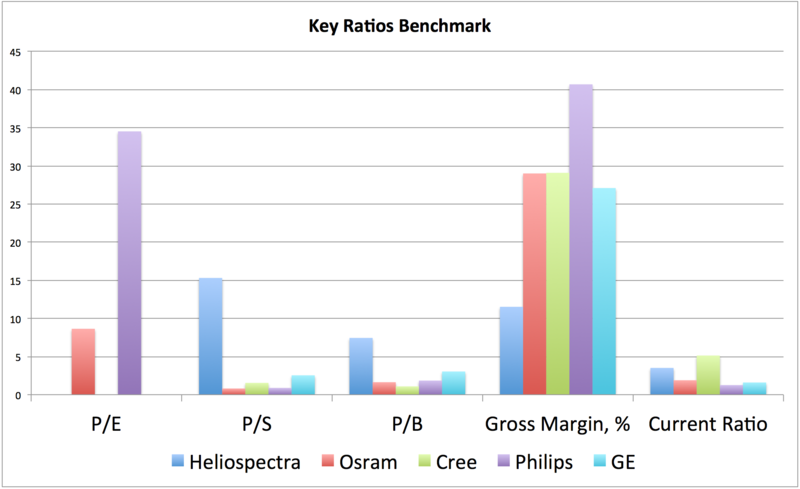 Anyhow, we can see how the valuation ratios, P/S and P/B, are rather high for Heliospectra compared with the others. This indicates that the market already values Heliospectra as a growth company and expects significant revenue growth during the next years. Gross Margins are not satisfying yet and this is something Heliospectra will have to address further on. It will probably stay low for at least the next 12 months as they will have great expenses ahead due to their expected future growth. P/E is negative and thus not visible in this chart. In today’s market climate, Heliospectra is a high-risk investment. They have started to prove themselves by earning larger and larger orders. Together with their new recruit Caroline from a competitor, and her experience, their team is slowly turning into a true Dream Team. And before they can start to conquer the market, they will have to address their cash situation. We believe in taking a half position in Heliospectra now and the other half after they have raised new cash. They will be presenting their 16Q1 report on Friday, April 29th 2016, don’t miss it. Disclosure: At the moment when this was published, I did currently own Heliospectra shares. I wrote this article myself, and it expresses my own opinions. I am not receiving compensation for it. I have no business relationship with any horticulture-related companies that are mentioned in this article. This article should not be regarded as a buy or sell recommendation or investment advice in any way.